New Delhi: Serious differences have risen between India and Japan on the funding and specifications of an ambitious, dedicated freight corridor here that both countries have been collaborating on for the last two years. Six days before Japanese Prime Minister Shinzo Abe’s first visit to the country, the Japan International Cooperation Agency (Jica) has assessed the cost of building the freight corridor at $11-14 billion (Rs44,770-56,980 crore), twice India’s estimate of $7 billion. An official who is part of the negotiations said that there are other disagreements as well, primarily on technology, length and the alignment of the proposed corridor. “The Japanese side has said that if India wants the freight corridor to run on diesel, they will not be able to provide the technology," the official said. A verdict is unlikely before October, by when Jica is expected to reassess the project’s cost. The disagreements have been brought to the notice of the Prime Minister’s office and the ministry of external affairs by the railway ministry, which conducted the Indian cost analysis. The external affairs ministry has also written to the Japanese government to try and resolve the matter. Jica has agreed to provide 30% of the construction cost of the proposed 2,700km dedicated freight corridor that is meant to link New Delhi, Mumbai and Kolkata, and reduce the transit time between New Delhi and Mumbai to36 hours from the current 60 hours. Roughly 30% of Japan’s contribution will be as loan. At a Tuesday meeting, Jica officials told the finance ministry that the New Delhi-Kolkata arm of the corridor should not be built because it is not feasible. Political compulsions in India, however, are making it difficult to decide, the finance ministry official said. A railway ministry official, who was also part of these negotiations before Tuesday’s meeting, said the Indian team was surprised when Jica hiked the cost of building the corridor by 100% “all of a sudden". 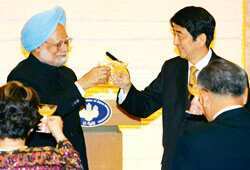 “Our estimate was Rs28,000 crore and the Japanese government’s turned out to be Rs56,000 crore," he added. He, however, disagreed with Jica’s view that India will not make the most out of a partnership with Japan unless it goes for the latest electric-locomotive technology. “Japan feels that diesel fuel will cause air pollution. They have said that the fossil fuel resources may deplete and that Japan’s expertise is not in diesel in the first place, but in electric technology," the finance ministry official said. But the railway ministry believes Jica’s insistence on electronics will only appease the Japanese locomotive industry, particularly because India will be obliged to purchase some assets from Japan for the corridor project as part of the funding arrangement. The “double-stacked container trains" that Indian Railways plans to run on one line of the corridor makes diesel a necessary fuel, the railway ministry official said. But he added that some suspect Jica wants to pull out of the project altogether; the excessively high price being an excuse. India hopes to announce the dedicated freight corridor as an instance of successful Indo-Japanese partnership during Abe’s visit. But two years into planning, the project is yet to even set up a board of directors. Japan had originally proposed to build a bullet-train line between New Delhi and Mumbai, but the Indian Railways had turned it down, saying that the freight lines were more urgently needed.